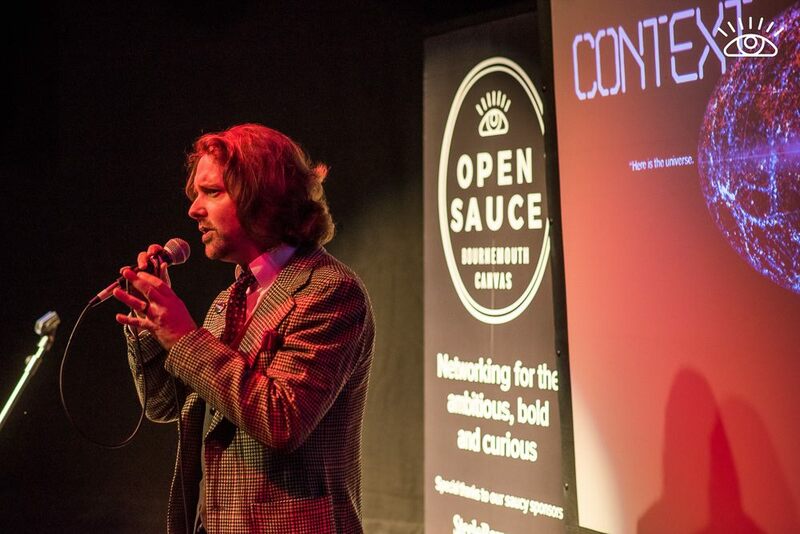 It involved, uncharacteristically for him, writing and learning word-for-word a very exact performance – for the successful south coast ideas networking event formats its speakers into Pecha Kucha-style delivery – twenty slides of twenty seconds each, timed. The result was something special, though as the accompanying article below, written for the Open Sauce magazine on the night, sets out, Timo Peach himself hardly considers himself an obvious hero for change. Living on the edge of tomorrow. Music artist, wordist and creative, Timo Peach – the bloke from Momo:tempo – has been thinking about the shape of the future. And is trying to work out how to cope with it. “I think, for me, this is a start. Nothing more impressive. Certainly not a conclusion of any kind. Just a dim awareness of a beginning in a restless fug. Much like the end of Farming Today when my radio alarm first goes off. It makes no sense, but I’m pretty sure something’s going on in a field somewhere, so frighteningly early the stars are still out. I thought I had thought about the future a fair bit since being in the present. Grew up drawing spaceships as instinctively as drawing at all, and I know I speak for a chorus of other nerds when I say that all our spaceship fantasies are long overdue now, thanks. I think this has something to do with expectations. The sort that come from stories I grew up with. We all grew up with. That came from the culture their writers were also born into – a sort of industrious confidence, even questionable arrogance, that still has the power to make me say “OOooh…” at the news that our nearest foreign star, Proxima Centauri, has an Earth-like planet in it’s ‘Goldilocks zone’, a tantilising mere 40trillion kilometres away. I mean, surely that’s not so far if we really put our minds to it? Last summer, the first glimmer of an idea dawned on me. As this idea for my next grand artistic endeavour began to take shape on scribbled layout pads around the studio, I began to really think about the future. And quickly began to realise that I’d never really thought it through properly before. Because, if I had, I might not want to think about it ever again. STAR TREK, OR ESCAPE FROM NEW YORK? I don’t mean thinking about how I really should have done something about a pension by now. I mean that futurey future – trying to predict exactly when my robot manservant will be clever enough to do the hoovering and the dishes and cheap enough so that an indolent chump like me can afford one but still stoopid enough not to suddenly twig its life would be much more logically efficient with me efficiently dead. Oh, wait. ..Isn’t that right now? The future is a minefield. With numbers and concepts to boggle the mind. Think about bots and bio engineering for too long and you begin to wonder where our humanity will be, not long from now. But, hang on, you might say – where is our humanity now? Doesn’t today have enough worries of its own? Tomorrow will take care of itself. And it’s true, you wise sausage, we don’t need to fret about the impending singularity to break out in a cold sweat and wrap our hazmat suits in duck tape. Who can understand all we are connected to already, like a human flood over Cornflakes? Who could ever do emotional justice to each single news item in one day, today? At what swipe count am I officially a bad person? And will it be obvious on Facebook? Coping with the present, with more than empty bad language, is challenge enough. I tend to feel a bit useless every day, in some way. But tomorrow is being shaped by the echoes of today. Which means we all need to think about the story we are collectively writing already. ..Awkward silence. This is, in fact, the point I’ve come to – that we sort of already are in that conversation, at least in the background radiation of our culture. Because those fearsome concepts of the future aren’t, well, alien to us any more. Creative imagineers have long started our collective therapy, helping us prepare for various frankly terrifying possibilities that those sickos have dreamt up and we are probably now developing. So now we’re all armed with at least a basic understanding of some fairly far-out concepts. Soon to be all too close to home. It surely means that you and I, plugged into the future as we are right now in such an unprecedented way, can properly start talking about the practical roadmap for tomorrow. You and me. So that we can as clear-headedly as possible work out where the hell we ought to have been starting from by now in the first place. SILENT RUNNING OR THE HITCHHIKER’S GUIDE TO THE GALAXY? Exploring a creative business life remarkably loose at the defining boundaries, Momo has taught me one thing if anything: I’m no data pin-up. I can’t exactly boast of numbers or names. No grand figures on the CV in any respect. Nothing to light up a spreadsheet or a Wiki page. Which could even mean that in the digital future of right now, I don’t even properly exist. Round-downable to zero, you might say. I’m behind you. If only my ‘green footprint’ were so insignificant. At the ‘sensible’ end of my business spectrum, Momo:Typo, working as designer, copywriter and art director in various brand development projects in one or two nice spots around the planet over the years, I’ve found myself alongside clients that, if I stood up and listed them as sectors and businesses at Radical Progressives Club, it might sound like a confessional. A bit of a rogues’ gallery. Property developers. Estate agents. Financial advisors. Plastics companies. Military test equipment engineers. And, y’know. Advertising agencies. However. What this has instilled in me, as a reasonably hapless jobbing arty type, is that there’s no simple template to change the world. When I think of those sectors, I can’t simply write them off from some lofty idealised distance. Because I don’t just think of my new kitchen. I think of particular people. The financial firm founder who’s quick wit drives a successful business as much as it drives his encouragement of humanity in the numbers. The friends in the Gulf who make me want to pull up my own socks in my attitude to professionalism and a certain reverent responsibility in their work. All the estate agents I know who found a local spot and committed to its community over decades. And all the ad men and women who also count among my most inspiring and clever chums, daily making business and art work together. Whatever the real world challenges and indeed compromises of doing what they all do, they’re individuals doing their best. Adding something. Making stuff. Alongside me. Here on Earth now. It’s no good being asked for directions and replying: “Well, I wouldn’t start from here.” We can’t secretly hope to be the people of Golgafrincham, devising a plan for losing the less worthy sounding jobs to a giant space ark. Our only pragmatic future is an inclusive one. What we do next will come down to two motivators, as ever. Context and consciousness: What we’re born into, and what inborn instincts keep pulsing up inside each of us. Us floppy, saggy, squelchy bags of fluids and bones who are native apes to the planet Earth and whose damn-fool ideas change things. Damn-fool ideas put in our heads by one thing: stories. None of these complex factors did you or I have a jot of say in. We were just teleported into the mix of it. What we do with that mix, however… perhaps that’s where we have a jot of say. ..And how we share what we do. Now that might be how we get more than a jot of say in the shape of a highly network-ised future. Is everything in the fearsome cauldron of Now really just our species trying to come to terms with who and what it really is? That we’re not the machines or holy statues we always thought we should be. In the future, our sense of identity may be the only true wealth we’ll be left with – or need. We might even be okay. If we face the future not with a daft, pyrotechnic fantasy of flying away but on something honest. On what we are. On our humanity. Coping with Now in 20 C-words.